CinemaBomb: Бродячие псы / Jiao You / Stray Dogs. 2013. 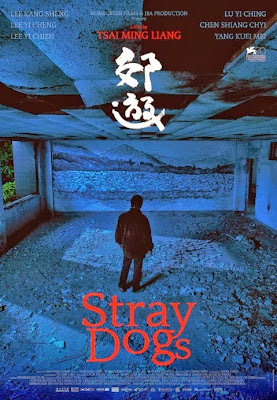 Stray Dogs is a film about patience – the patience of the characters trying to survive in Taiwan’s lower class urban belly, as well as the patience of the audience watching. The film tracks a poor, nameless family’s life over a few days’ time. There is the father (Lee Kang-sheng), whose job is to hold up signs advertising high-end condominiums along the highway; his twelve-year-old son (Li Yi-cheng) and six-year-old daughter (Lu Yi-ching), who spend their days exploring riverbeds and looking at groceries in the supermarket; and a female supermarket worker (Chen Shiang-chyi), who feeds stray dogs inside an abandoned building at night. The characters’ actions intertwine and the audience is given a look into the harsh realities facing Taiwan today. Director: Ming-liang Tsai / Минь Льян Цай. Cast: Shiang-chyi Chen, Kang-sheng Lee, Yi Cheng Lee, Yi Chieh Lee, Yi-Ching Lu, Jin-kai Wu, Yang Kuei-mei. Download Бродячие псы / Jiao You / Stray Dogs.